ACTIVA8® is composed of professionals with solid, wide experience in the implementation, development and monitoring of clinical trials in various therapeutic areas and special indications. 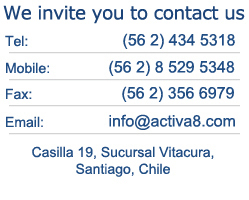 ACTIVA8® has open and direct communication with client involvement in all clinical trial operations. 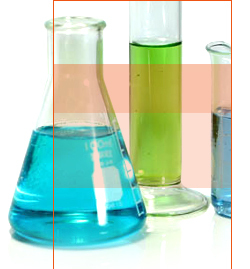 We maintain longstanding relationships with investigators, regulatory agencies, health authorities and our clients. ACTIVA8® personnel receive updated training on GCP, internal SOP's, specific therapeutic areas and indications. We are bilingual: Spanish and English. General Manager, is the founder of ACTIVA8®. She has wide experience in clinical research management and regulatory affairs in various therapeutic areas. Her work experience includes organization, installation and country management of business operations for international Contract Research Organizations and multinational pharmaceutical companies in Chile. She performed basic science research in Molecular Biology and Virology in prestigious universities and biotechnology companies. She also obtained clinical experience from public, university hospitals and private clinics. She participated in scientific publications in Virology. V. Lezano has scientific studies in Biochemistry and Medical Technology at the University of Wisconsin, Madison, USA, and Universidad Austral de Chile, Valdivia, Chile. She obtained her BS degree in Medical Technology, majoring in Clinical Laboratory, Hematology and Blood Bank, Universidad Austral de Chile (1987) and earned a B.A. degree License in Science of Business Administration and Commercial Engineering in Business Administration, Universidad de Santiago de Chile, Santiago, Chile (2002). V. Lezano has an active role in supporting medical staffs that perform clinical trials in Chile and other countries in Latin America; based in local regulatory affairs and GCP/ ICH guidelines. She has received various training in GCP/ ICH Guidelines for clinical trials worldwide. At ACTIVA8® V. Lezano is responsible for managing Clinical Operations and business development. She organizes all related tasks, works closely with monitors and supervises the services as a Project Manager in continuos contact with the investigators, the sites staff and sponsors in all matters related to the development of clinical trials.